The blue spruce tree (Picea pungens) is also referred to as Colorado blue spruce or silver spruce and is chiefly native to the western U.S. and the Rocky Mountains. An excellent windbreak tree, the blue spruce is susceptible to fungal diseases that cause its needles to turn brown or red and prematurely fall. A lack of moisture is the chief suspect when the blue spruce tree begins losing its needles. The first symptom of water stress is the browning of the needles followed by their dropping to the ground. In addition to summer drought, a succession of three dry winters will damage the needles. Additional water should be applied to the soil surrounding the blue spruce during the winter months. The tree is not well-adapted to high heat or dry wind. If a blue spruce is turning red and losing its needles, it likely is facing an onslaught of needle cast disease caused by the fungus Rhizosphaera kalkhoffii. This disease most often springs to life in wet, warm weather when the temperature ranges from 65 to 75 degrees Fahrenheit, with the fungal spores spreading easily through warm rain. It causes the needles of the spruce to take on a reddish-purple, brown or yellow tint before they fall from the tree. Black, fruiting bodies of the fungus will also form on infected needles. 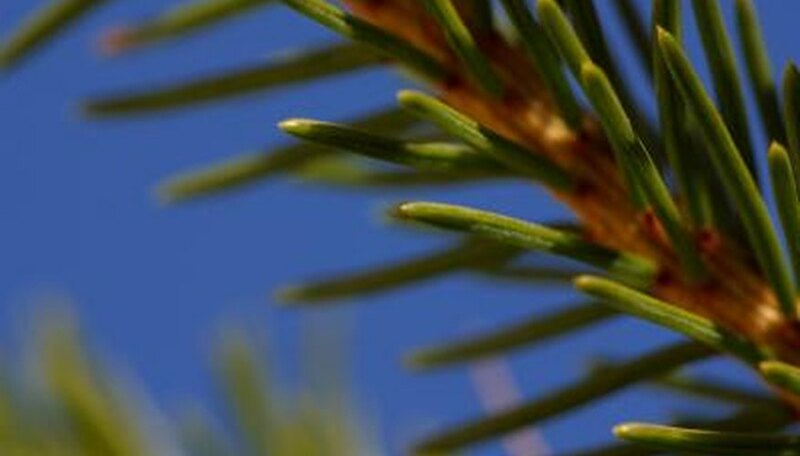 The red color on the needles of the blue spruce will typically occur in August followed by a browning and then dropping of the needles. If the branches are completely defoliated for a span of four to five years, the stress may eventually kill the tree. Fallen needles should be raked and discarded. Fungicides are available to control this disease. Spruce needle rust, caused by several different fungal species of the genus Chrysomyxa, is so named for the red, pink or orange color the disease displays on the needles of the blue spruce. The disease first appears as a yellowing of current year needles near the tips of the branches, followed by the development of reddish-orange or white projections on the needles. These growths serve as the reproductive center of the fungus and release orange or red spores into the wind.